While there’s evidence that getting a college degree pays off in the long run — mainly with a higher income level — education can be expensive and there’s no guarantee that the jobs available upon graduation require the knowledge and skills acquired. A recent report by the Urban Institute, a think tank that carries out economic and social policy research, looks at the mismatch. Researchers examined 387 metro areas across the country to find how closely the knowledge jobs require aligned with the skills people have. On a national scale, the report found that nearly two-thirds of jobs require a high school degree or less at entry level. But, for those 25 and older, 60 percent have more than a high school education. "This creates a potential imbalance between jobs and people for each level of postsecondary educational attainment. For example, the share of people with 'some college' exceeds the share of jobs that typically require that level of education by 18 percentage points. The difference for four-year degrees is more modest, at only 5 percentage points," the report reads. On a more local level, the report found in Wisconsin the most difficult place to find a job if you have a college degree is Madison and Milwaukee. Both have major universities that turn out a lot of graduates. 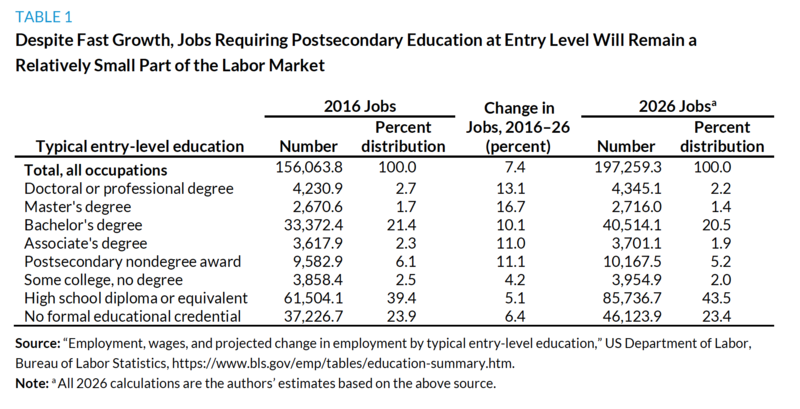 But the report says supply is greater than demand: there are more people looking for a job than there are jobs that correspond to that education level. "So it would be harder to leverage your degree for a full effect because there’s so many who are competing for those same jobs," explained Molly Scott, senior research associate at the Urban Institute and co-author of the study. But in some Wisconsin cities, the jobs available more closely match the education level of job seekers. Two of these metro areas are Janesville-Beloit and Green Bay. Across the country, 87 percent of the metro areas studied had people working at jobs that didn't match their education — they were in essence, over-qualified. The study didn’t look at labor force participation, and so the gap between education and employment in some areas could be even greater, said labor economist Matías Scaglione with the Wisconsin Center for Education Research. "Labor force participation rates for people with bachelor’s degrees or higher are 73 percent, more or less. For those with high school degrees it's 58 percent," Scaglione said. "So that’s why focusing on population can be misleading. We have to focus on labor force and then employment." Scaglione, who was not involved with the study, said the skills gap has been brewing for a long time. "Basically college degrees have been growing, and college education expanding and then jobs not really being there for all the college graduates," he said. A historically high number of people are getting some sort of post-secondary education. Despite this fast growth, the study states entry-level jobs requiring a college education will remain a relatively small part of the nation’s labor market. The study’s author, Scott, said it's hard to argue that people shouldn’t get more education because there’s this increased competition among people with higher degrees. "But there’s a question about can we pair it with entrepreneurship education and access to capital," she said. "So you are not just getting your degree and hoping that there will be a business or a job waiting for you but actually support the development of higher end jobs." The report states workers are better positioned than ever to contribute to their communities if policies, businesses and institutions at the national, state and metropolitan levels provide the opportunities needed for them to succeed.